From Badrinath, vehicle can move up to Mana village which is 3km away from Badrinath. Mana is the last Indian village in this area. As it is border area between China and India there are many military and ITBP camps. From Mana metal road is available up to Ghastoli and you can go towards Kalindi Khal via this road. The other road will lead you to Basudhara with Alakananda river on your left side. This stretch is commutable by common travelers. You have to take the third one which goes down and crosses river Alakananda. Now you will get the river on your right side. 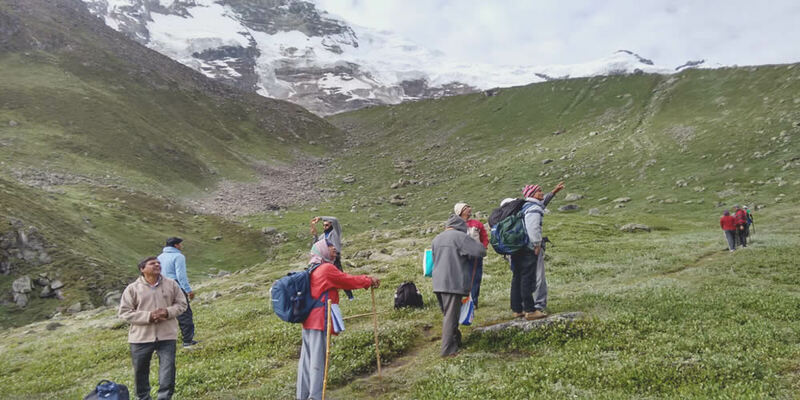 Swargarohini Yatra introduce for the first time in the history of India is a comfortable and meticulously planned journey at an altitude of about 14000 to 16000 feet. Swargarohini Yatra will be a benchmark in religious tourism industry of India with all good facilities like journey, stay, travel, food and medical attention in emergencies etc for the pilgrims. 1st day First you will see a temple and then the path goes through a stretch of agricultural land. After a walk of good two hours you will reach wide grassland. Yes, it is Ghastoli. You can see beautiful Basudhara fall on the other side of Alakanada. During post monsoon season one should keep lot of water with him as water crisis very common at this stretch. You will reach Lakhsmiban, surrounded by some birch trees, after crossing this grassland. Height of Lakhsmiban is 12,000ft. Start early in the morning. Walk just about 2km and you are at Bandhar. A nice small camping site. You can find a cave also there, where 3 to 4 persons can take shelter in emergency. On the other side of Alakananda you will find Bhanaglung glacier. It is the originating point of Alakananda. This place is commonly known as Alakapuri. 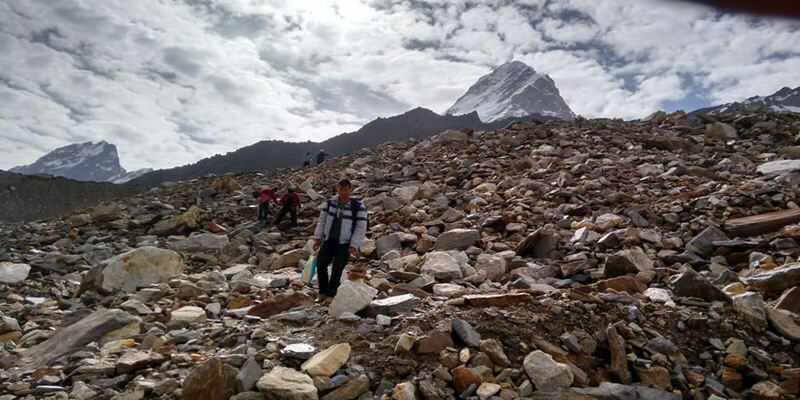 Besides Bhanglung glacier, there are some more glaciers which also contribute to Alakananda. From now on the path is full of boulders and gains height noticeably. After some good walk you will reach Sahasradhara. On the right side Bhagirath glacier is visible down below. Your path goes over the narrow ridge of that glacier. This part of the journey is definitely risky. On the right side, behind the glacier is Balkun peak. On the left side Narayan peak and behind you is Neelkanth. After negotiating steep height through the boulder covered path you will reach Neelkangh base camp. Now Neelkangh peak is in front of you! Chakrateertha is not far away. After crossing some more boulder covered slope you will be at Chakrateertha. Here you will find some caves of different sizes. These can accommodate good number of people as night shelter. At 15,000ft, surrounded by splendid Choukhamba, Balkun and Neelkanth peaks, the atmosphere is simply superb. All days fatigues will disappear at this nice place. On this day you will face the real tough journey. The path goes straight upwards almost like a wall. Definitely it will make your pace slow but one hour trek will bring you to the top of the glacial wall. Here you can rest a while though cold wind will welcome you. Now go down about 100 ft over loose rocks .Cross the glacier covered with rocks of many sizes and shapes diagonally very carefully. Then climb again to the top of the glacial wall. And see… that bluish-green water reservoir ….almost triangular shape! It is your Satopanth Tal. You have reached at last. There is a concrete hut with low roof. You can pitch your tent there. You will find some caves where Sadhus live. From Satopanth, you can see Swargarohini with Choukhamba by its side. Balakun peak also visible clearly. One can visit Suryatal and Chandratal (Not in Lahul and Spiti) from here within a day. Day 4th way back start early so you can reach Bandhar by afternoon. Above Trip cost :: 20000 Per Person :: Deluxe 25000 per person. It’s a triangular shaped lake with each side about 1 Km. long. 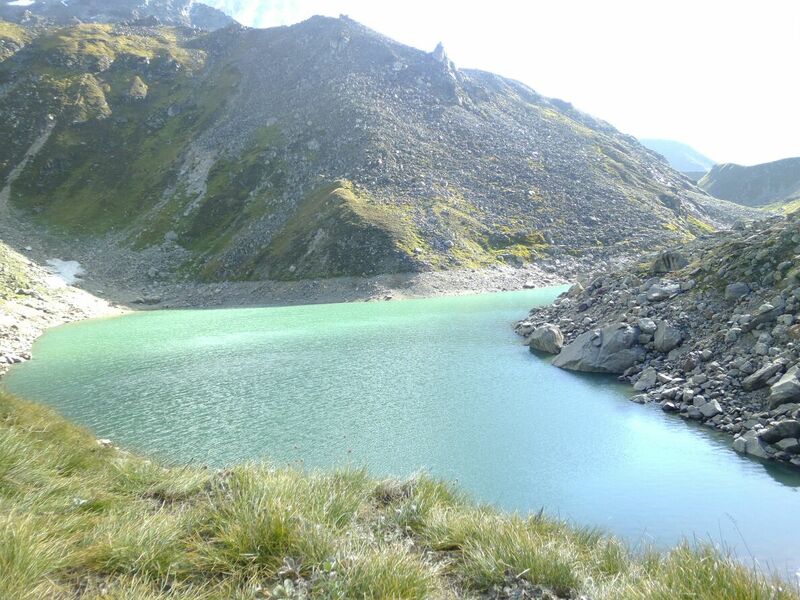 The crystal clear water had a greenish colour and all around the lake stands mighty Himalayan snow peaks. From left to right they are Mt. Neelkanth(21638 feet), Mt.Satopanth(23,206 feet), Mt. Swargarohini(20507 feet), Mt. Chaukhamba I(23413 feet) and Mt. Balakun(20040 feet). As you came down at the bank of the lake you can see the reflection of Mt. Chaukhamba on the water. It was beautiful beyond expression. After Early Breakfast Drive From Haridwar to Joshimath. Night stay at Lodge. On Day three we will Star our Trek towards Bandhar, in the midst you will see Mana the Last Indian Village before Tibet Border. there is a Waterfall Called Vasudhara, which is known as a holy waterfall which will wash your sins according to the Hindi Scriptures. The trail was through bolder zones. You will cross the Sahasra Dhara and the Neelkanth Base Camp on our way. Specifically, there is no trail, you just have to make your own way with the Guide. You will see the Alakapuri glacier, which is the source of Alakananda river. Now We will Trek Back to Mana then Drive back to Badrinath , Night stay at Badrinath. Early morning after Breakfast e will Drive Back to Haridwar where leaving the Hills Behind. 1. Twin/Triple sharing accommodation camps during the entire trip. 2. All meals hygienically cooked and served by our specially trained staff. 3. Transportation from Rishikesh to Rishikesh during the entire trip by Local / Toyota Jeeps. 4. Services of Experience professional trekking guide during the entire trip. 5. All tourist taxes during the travel. 6. Visit to all important temples and places during the entire trip. 7 Trekking permits and camping fees on the treks. 1. Items of personal nature e.g. table drinks, telephones, laundry, insurance, medical services and services in unforeseen circumstances. 3. Any other trip other than specified above. 1. Subject to Government service taxes which is 5% at present. 3. Valid for the Trekking season for 2018 March to November.